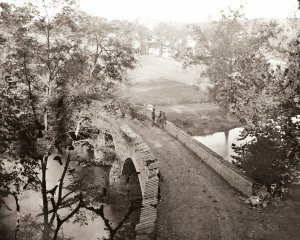 In honor of the anniversary of the Battle of Antietam, I reblog an article from 2011 about two old friends reunited on the morning of the battle. The playing field was level, in a manner of speaking, early in the war. But imagine what it was like for a new, green unit, virtually without training, to be thrown into battle in 1862 or 1863. Inexperienced soldiers going up against battle-hardened veterans. A dreadful situation. This entry was posted on Thursday, September 17th, 2015 at 7:11 am	and posted in American Civil War. You can follow any responses to this entry through the RSS 2.0 feed.